Sally Spencer, faculty in the Michael D. Eisner College of Education, presented a demo of CSUN Simulation Services to faculty in the Department of Social Work. Photo by Lee Choo. Technology is evolving at a fast pace and becoming increasingly helpful in education. California State University, Northridge professor Sally Spencer won the CSU Faculty Innovation and Leadership Award for working on a learning program that is shaping the way students practice skills in the university classroom by combining artificial intelligence and virtual avatars. The SIMPACT Immersive Learning program is a system created by the University of Central Florida. Students interact with virtual avatars to practice interpersonal skills and collaboration. 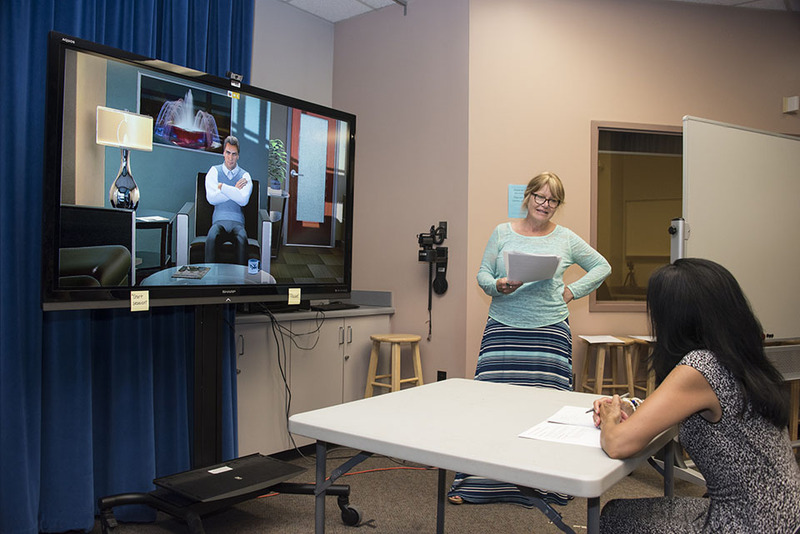 Whether it’s a classroom setting or a one-on-one counseling session, the students can learn from these life-like scenarios in a virtual environment. Spencer has spent the last seven years institutionalizing the program at CSUN, the 13th university to have this technology. In the 2017-2018 year, more than 1,500 CSUN students were able to use the system thanks to her work. The CSU recognized 26 faculty members with the Faculty Innovation and Leadership Awards for their commitment to student success. The awardees teach in a variety of fields from journalism to social work and beyond. Awardees received a $5,000 cash award and $10,000 was allocated to their academic department. Spencer is a CSUN professor of special education in the Michael D. Eisner College of Education and the Director of SIMPACT Immersive Learning. She was nominated for the award by another CSUN special education professor, Rachel Friedman Narr. Currently, CSUN is providing the simulation services to two other CSUs, two private universities in California, Idaho State University and a school in Sweden. Spencer is hoping to use this simulator more in higher education. The SIMPACT team reaches out to different fields and wants to work with more colleges and universities. CSUN’s department of social work and marriage and family therapy have been doing extensive training with the simulator.